How good are these guys! 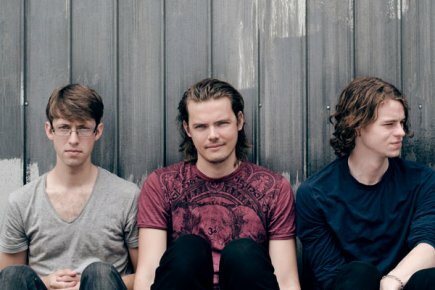 With the industry buzzing, global label deals about to be announced and the worldwide release of their album Dark Eyes slated for March, 2013 will be the year of Canada’s Half Moon Run. Across the globe from NME to Brooklyn Vegan, tastemakers and musicians (including Mumford and Sons) are all singing the trio’s praises and Australia is lucky enough to get the year’s first look, in a run of intimate venues around the country. Half Moon Run’s unique sound fuses together the restless elements of indie, pop and roots with beautiful rhythmic harmonies, delicate guitar lines and a hint of warm electronica. Since attracting the attention of industry in a run of global showcases throughout 2012, the international buzz has kept building. The band released their first single “ Full Circle” in their home country, quickly gathering nearly 300,000 YouTube views before setting off on a US and European tours with Metric and Patrick Watson. The track attracted the attention of tastemakers including BBC1’s Zane Lowe and influential LA station KCRW. Their run of global shows will bring their unique sound to Australian audiences including the Woodford Folk Festival and Peats Ridge. Next PostK25: Kylie & Jason! Especially For You Live Thrills 02 Arena In London!